Today, Apple and China Mobile finally announced a distribution partnership that had been heavily rumored for months. While the deal to sell iPhones through China Mobile isn't surprising, the wild variation in analyst estimates is. Let's take a look at a few wrinkles that may be playing havoc with these estimates. The easiest numbers to find on Chinese carriers are usually subscriber details. 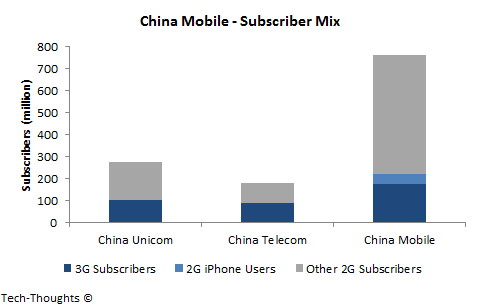 The chart above shows the 2G/3G subscriber mix on the three major Chinese carriers. Therefore, the details that analysts typically use to base sales estimates are -- subscriber base, 3G subscriber base and number of unlocked iPhones (2G) on the network. For China Mobile, these figures are 759 million, 176 million and 45 million respectively. Bernstein Research's survey also shows that some China Mobile subscribers use smaller carriers for data service, so these subscribers may have been excluded from these estimates. Analysts are also aware that China Mobile does not offer mobile number portability -- Given the status granted by specific blocks of numbers, some analysts may have assumed a major sales impact. However, there are much more important factors at play in the Chinese market, which analysts have certainly not taken into account. We can use the identity-utility concept to explore this further. We already know that the proportion of identity-focused customers in China is far higher than in markets like the US and Europe. This is caused by the subsidized pricing structure in China that mandates full upfront payment, with subsidies given out in the form of monthly refunds. Among China Mobile subscribers, the value of identity granted by the iPhone is so high that 45 million subscribers use iPhones on dated 2G networks. It should be obvious that the degree of overlap between, 1) identity-valuing 2G iPhone users and 2) subscribers that value the prestige associated with certain number blocks, is likely to be very high. This implies the lack of mobile number portability on China Mobile may not have a major impact on iPhone sales. Therefore, the bulk of China Mobile's iPhone sales will be driven by customers who -- 1) value the ownership of an iPhone, 2) value the utility associated with using an iPhone and hence, need 3G/4G data service, and 3) have not already upgraded to an iPhone 5S/5C from the gray market. If analysts took these factors into account, my guess is that the range of their estimates would be much narrower.